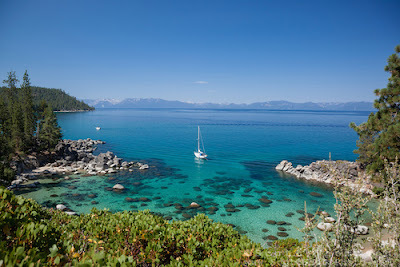 Occasionally I get phone calls or emails from people asking me where they should photograph Lake Tahoe. They are usually only up here for a few days while on vacation and don't have a lot of time to explore. I tend to recommend the "must see" and easy locations like Emerald Bay or Sand Harbor. But there are also some great areas around the lake if you are willing to go on short hikes. Lake Tahoe's East shore has many short hike areas that are great for photography, one of my favorites is the Chimney Beach, Secret Cove, Whale Beach area. This is about a mile of shoreline that has tons of granite boulders, beautiful pine tree covered points, and aqua blue waters. Must have camera gear for the area would be a wide angle lens and a polarizing filter. The wide angle views are stunning and the polarizer will help you cut through the glare on the surface of the lake and capture Tahoe's famous blue, aqua, emerald, and green waters. Below is a slideshow of images I've captured from the area. Prints, photo gift items, and digital downloads are available. Here is a link to these images on my website where they can be viewed larger and purchased: Tahoe Photos Gallery. If you have any additional questions about the area, please don't hesitate to ask in the comments section below. Hello Caroline. The west end of Donner Lake should be great. There is a big pier near Commons Beach in Tahoe City. When that gets snow on it, it looks very cool. Both locations should be easy access too. Good luck! Hi, I am also looking for snow shots, but I am wondering about areas that have lots of trees, that would look like a dense forest. Do you know of any places like that, that are around South Lake Tahoe? Adam, anywhere around Camp Richardson should be good. Hi Scott. Any recommendations for great sunset shots, particularly on the south side of the lake? Hello Carmen. Emerald Bay is a great spot for photography on the south side. Sunsets and sunrises can be incredible there, but you have to be a little lucky of course... If you have a little more time, I would definitely make the short drive up the east shore and check out some of the boulder lined shoreline there. Sunsets can be incredibly intense sometimes since you are looking toward the sun. Hope that helps! Hi Backyard Productions. Awesome photo! It was great to meet you too. Funny coincidence.